When travelling by car from the US, drive north of International Falls on Hwy 71 to Sioux Narrows. We are located on Miller Road, next to the Pinnacle Gift Shop on the Main St. in downtown Sioux Narrows. 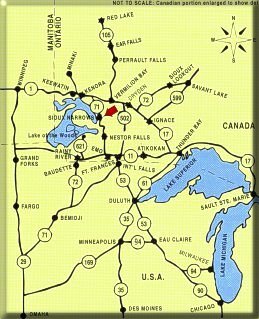 Commercial Flights - fly to International Falls, MN. by Northwest Airlines, North-Air can drive you to Sioux Narrows. By air you may fly commercially to Kenora, Ontario or by private aircraft to Nestor Falls. We offer ample safe parking for any vehicle size.